The farm Glenlyon forms the core of the new Hantam National Botanical Garden. The previous owner of the farm, Mr. Neil MacGregor, has recorded this history of the farm. In 1883 the farm Katlaagte (later Glenlyon) was purchased by James MacGregor, who came out from Scotland with his family in 1840. One of his sons, Joseph MacGregor, moved to the farm and started to farm on Groenrivier. He married Elizabeth Moyle, eventually known to everybody in the district as “Mumsie”. Joseph later became very ill and moved to Cape Town. Managers were appointed to look after the farm. After his death in 1922, Gordon, the eldest child, was compelled to terminate his studies at Oxford University to save the sinking ship in 1925. In 1928 Gordon married Helen Lyon. In 1929 the Glenlyon homestead was built, having been designed by John Lyon, Helen’s father, who had qualified as an architect in Scotland. Glenlyon was named by Gordon to honour his wife, Helen Lyon, and his own Scottish origins. 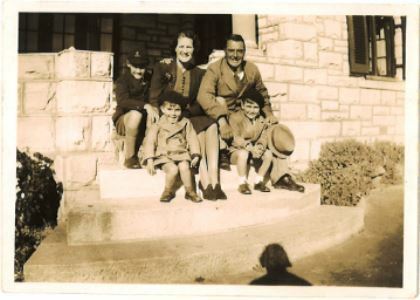 Gordon MacGregor and his sons on the steps of the old, original homestead, now the Hantam NBG office. In 1968, their son Neil married Neva Jankowitz from Germiston. The door at Glenlyon was eventually opened to ecotourism which brought many ecologically-minded people from all over the world to the farm. 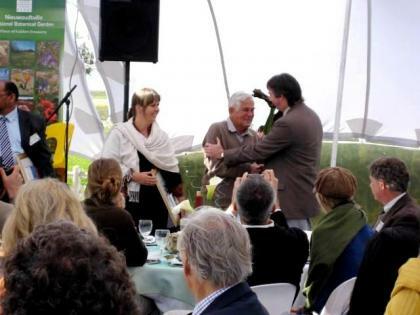 Botanists and scientists became involved in exciting projects on the farm, culminating in the three-year Conservation Farming Project managed from Kirstenbosch by Professor John Donaldson. In 1960 Glenlyon started flower tours on the farm, hiring the only bus in Nieuwoudtville. In 1991 an old Bedford bus, seating 25 people, was purchased and it has become quite legendary in the ecological world. The tours rapidly became very popular and ultimately a 45-seater bus, pulled by one of the farm tractors, was purchased. In 1991 the BBC Natural History Unit approached Neva and Neil in connection with the filming of The Private Life of Plants. Excellent rains fell in 1993 and the team stayed on the farm for three and a half weeks. Many school and university groups from near and far visited the farm for various projects. As none of Neva and Neil’s four children wanted to farm, Glenlyon was sold to SANBI in 2007 and has now become the ninth National Botanical Garden managed by SANBI. The purchase of the farm Glenlyon was made possible through generous funding provided by the former national Department of Environmental Affairs and Tourism (DEAT), Conservation International (CI) through the Global Conservation Fund (GCF), and the Leslie Hill Succulent Karoo Trust through the World Wide Fund for Nature (WWF, South Africa).